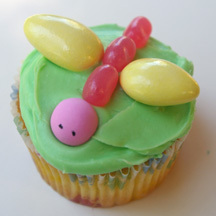 Use candies of various shapes and sizes to make dragonfly, butterfly and bug cupcakes. Go with pastels or bright colors, but whatever you do, have fun! What You Need: 1 cupcake; green frosting; assorted candies such as jellybeans, Jordan almonds and candy-covered mints; food-safe pens . How to Make It: Frost cupcake. Arrange candies on top. For dragonfly shown, make row of three pink jellybeans and position yellow Jordan almonds on each side for wings. Draw 2 black “eyes” on round candy and add for face. 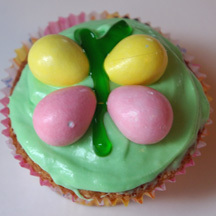 With candy-coated chocolate eggs, or pastel M&Ms, you can make spring butterfly cupcakes in seconds. What You Need: 1 cupcake; frosting tinted green; 4 pastel candy-coated chocolates; green (or black) writing icing or gel. How to Make It: Frost cupcake. Arrange candies as wings. (You can also decorate the wings with sprinkles or icing if you’d like). Use gel or writing icing to draw body and antenna. 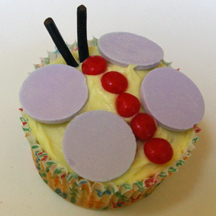 There are probably as many ways to make butterfly cupcakes as there are species of butterflies. This version uses mini sugar-coated fruit slices for the wings and chocolate chips for the body. Add some round sprinkles and gel and you’re off and flying! What You Need: 1 cupcake; white frosting; 2 mini sugar-coated fruit slices; 4 chocolate chips; black gel writing icing in tube; round pastel sprinkles. How to Make It: Frost cupcake. 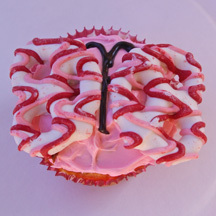 Place chocolate chips in line going from one edge of cupcake toward the center for butterfly body. 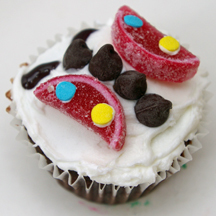 Add 2 fruit slices, with round edges facing, on opposite sides of “body.” Use gel icing to pipe black antennae. Use dab of white icing to stick sprinkles to wings. Spring is in the air, and so are butterfly cupcakes. There are probably as many ways to make butterfly cupcakes as their are butterflies, but this is one of the easiest. 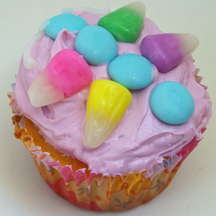 What You Need: Cupcake; icing tinted lavender (or color of your choice); 4 springtime candy corn (sold around Easter and in candy shops); 4 pastel M&Ms of the same color. How to Make It: Frost cupcake. Line up 4 M&Ms in the center of the cupcake. Add candy corn, points outward, for wings.